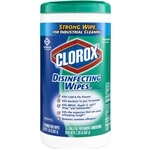 Restaurant kitchens can be kept bacteria free by wiping down everything with Disinfecting Wipes. We sell strong commercial sanitizing wipers to clean your kitchen and restaurant floors, equipment, doors, bathrooms and more. 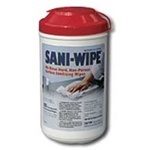 Germs won't stand a chance against our germicidal wipes. We sell Disinfecting Wipers to sanitize every inch of your restaurant from the tables to the chairs to the door handles and the floor. Wholesale commercial Disinfecting Wipes destroy the bacteria in your restaurant and foodservice establishment preventing the spread of germs. Keep your kitchen, dining areas, restrooms, high chairs and equipment germ free with Clorox Wipes, Lysol Disinfecting Wipes, and Sani Wipes.